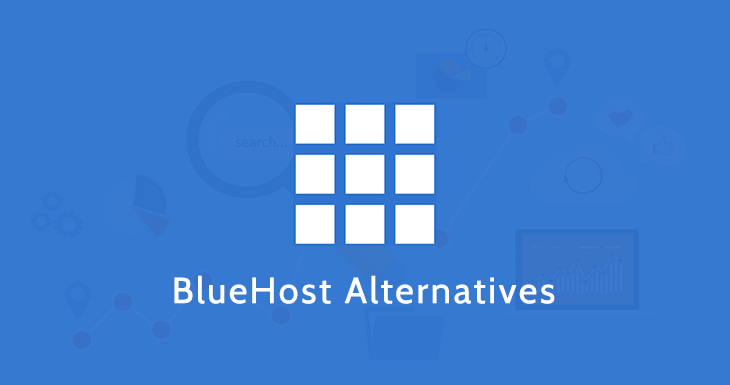 5 Alternative to Bluehost in 2019: Find Which One is Right for You? BlueHost is one of the most popular web hosting providers and comes in the list of top hosting services in the world. Indeed, popularity doesn’t mean it can fulfill all of your hosting needs. Are you searching for the best affordable Bluehost alternative to get high speed server, friendly support, and reliable hosting? In this article, I will be sharing recommended hosts for quality services but at the reasonable price tag. No doubt, BlueHost offer cheap hosting with a free domain name. But, when we talk about website loading speed and uptime stability, you may not agree with me anymore. Right? Their shared hosting servers are not as fast as other providers in the same price range. However, if we neglect speed, frequent downtime is another issue. *With cache plugins, you can improve loading speed. Now let’s discuss top hosts that are also capable to deliver quality hosting, performance, uptime, and reliability. I am personally using or have used some of the web hosts listed below. All of these hosting providers have excellent user rating, credibility, and years of experience in utilizing servers performance. They value your money and offer possibly the best hosting experience. SiteGround is one of the names that I can recommend blindly to anyone who loves to have fast and reliable web hosting. All of their plans are crafted with cutting-edge technology (NGINX, HTTP/2, and PHP) and optimized for speedy hosting. One of the main reasons for blazingly fast speed is SSD’s usage. They built their servers with solid state drives which ultimately results in loading your website under 1 second. Apart from SSD’s, they have in-house cache mechanism called “SuperCacher” to make the cache of your site’s static and dynamic content. When the visitors surf your blog/website, it loads website resources within few seconds not more than 2, usually. I have a couple of sites hosted on SiteGround, the hosting performance is incredible with 99.9% uptime. This is why SiteGround is one of the excellent Bluehost alternative hosts. Every plan includes free SSL certificate (HTTPs), drag-and-drop website builder, SSH shell access, HTTP/2 enabled, and of course, cPanel to manage your web hosting account. With the help of one-click feature, you can enable SSL on your website. Their user friendly WordPress installer takes only 3 mouse click to install WordPress CMS with enabled HTTPs protocol. This means you don’t have to activate SSL separately. Regarding support services, SiteGround offer multiple ways to back you through 24/7/365 live chat, phone call, and ticket system when help required. Their live chat is insanely responsive, it doesn’t take more than a minute to get connected. They also provide 30 days money back guarantee with no questions. InMotion is also a great alternative to BlueHost with having A+ BBB rating and CNET certified hosting provider for 14 years. They offer SSD storage with 99.98% server uptime on Linux and Unix servers. If your primary concern is loading speed and support services, then InMotion would be a perfect choice. They have a proactive monitoring system which minimizes the risk of downtimes and ensure maximum availability. All of their hosting packages include SSD drives and free data backups at no extra cost. They allow free domain name with hosting account, free Comodo SSL, One-click installer, and SSH access. You can also choose “Max Speed Zones” to double website loading speed. Furthermore, integration with CloudFlare CDN plays a vital role to enhance performance. InMotionHosting provides unlimited storage and bandwidth for all plans. However, you can host two sites on the basic plan named as “Launch”. Additional features are also included such as free themes, $250 free marketing credits, unlimited email accounts, free site migrations, and malware protection just at $4.19/month. You can access the support team via live chat, phone, email, support ticket, and Skype as well. When it comes to refund, InMotion has taken it seriously and give 90 money back guarantee which clearly shows their level of confidence regarding service quality. As a premium customer of InMotion, I can’t resist myself to recommend them for fast, robust, and secure web hosting services. You get more value than the money you pay. A2Hosting managed to get a position in this list of alternatives as it delivers better uptime than BlueHost in my testing. Though I have not used it for a long time but my speed, uptime, and performance tests clearly show that it worth using. Their shared servers are built with solid state drives and advanced hardware to deliver 20x fast loading speed. Furthermore, you can also choose “Turbo servers” to get faster speed. They offer a variety of other hosting solutions including cloud hosting, dedicated hosting, VPS hosting and domain registration. They have Windows and Linux based plans to fit every user’s need. You can access your hosting account via SSH command lines as well. Security is the most crucial factor in online business, it also helps in building customers trust, and that is why A2Hosting offer FREE SSL certificates for all accounts. You can avail shared plan at the cost of $3.92/month to host blogs and websites having moderate traffic. Shared plans are highly optimized for WordPress, Joomla, and Drupal, in fact, they have a WordPress cache plugin (A2 Optimized) to boot site speed. Compared to BlueHost, you get high speed, incredible uptime, and unlimited storage. Like SiteGround, there is also no cap on bandwidth as well and allow unmetered data transfer. They provide technical support via live chat, ticket system, and phone call around the clock 24/7, every day, even in the holidays to fix any issue you might face which happened very rarely. They also care about customer’s investment and have 30 days full refund policy and a prorated refund for unused service credits. WPEngine provides managed WordPress hosting services for highly optimized web hosting especially for WordPress websites. Though their prices are much higher than BlueHost but they offer best-in-class performance, flexible scalability, lightning-fast storage, and bullet-proof security. The availability of different data center options making it the top alternative to Bluehost besides pricing. They have four data centers and a CDN network to ensure fast site speed. Data protection is very critical in the digital world, and that is why WPEngine secures your site by monitoring threats, robust firewall, and implement the latest security measures. On top of that, they also take automatic daily backups to avoid data loss due to hardware failure. With WP Engine, you’ll get global CDN, one-click SSL activation, page performance reports, and evercache features to maximize speed. “Personal” managed plan costs $35/month with following configurations; 1 WP site, 25k monthly visits, 10GB storage, CDN ready, free SSL certificates, and regular backups. Webmaster and bloggers whose’s primary goal is focusing on productivity rather than handling technical issues can choose WP Engine, it’s a piece of mind. The first package is suitable for small blogs. However, you can pick higher plans for bigger sites. They take care of each technical issue and help you around the clock 24/7/365 days via live chat and phone call. All you have to do is log in to your account and contact them. They have an in-house expert team to assist you anytime whenever required. You can also browse the “Support Garage” section to get immediate help. DreamHost doesn’t need any introduction as WordPress.org officially recommends it. PC Magazine ranked them number #1 for overall performance, reliability and technical support over many big brands (iPage, GoDaddy, and BlueHost are few names). They are in the hosting industry for the last two decades which make them one of the most experienced hosting providers. They are handling more than 1.5 million websites and domain names on their platform. Like the above companies, DreamHost also provides SSD powered hosting for all plans, no matter if it’s shared, cloud, dedicated, or VPS hosting. You get a Remixer website builder, free themes, custom control panel, free Let’s Encrypt SSL, one-click installer and much more at very reasonable prices. This Bluehost competitor claims to offer a guaranteed hundred percent uptime and unlimited storage. They also allow you to host unlimited websites with infinite bandwidth whereas BlueHost allows one domain and limited storage in the basic plan. To provide more value for the money you pay, they offer Free domain WHOIS as well. Their 97 days money back guarantee is the largest refund duration in the entire hosting industry. A cheap and unreliable company never offer this kind of refund time, so with this, you can roughly guess the quality of DreamHost’s service. Upon canceling the subscription within the first 97 days, they will return all the money you paid. DM’s support staff can be reached by 24/7 live chat and email. However, for call support, you have to subscribe for “Request a callback” feature which cost an additional $9.95/month for 3 callbacks per month. Instead of paying for phone calls, you can use instant live chat to get help regarding your problems. Which is the Best Alternative for BlueHost Hosting? If you ask me which host should I choose, I would say without any hesitation “SiteGround”. They are the best, demand a reasonable price with a bunch of features. The only limitation is monthly visitors, and apart from that, SiteGround offer an incredible uptime, under 1-second loading speed, and fastest customer support in the industry. Furthermore, WordPress.org also recommend them as a reliable web host. Now, for users who are planning to manage more than one site with unlimited storage and bandwidth then feel free to choose InMotion Hosting. They also offer economical and budget-friendly hosting. On top of that, you can pick “speed zones” for enhanced speed and enable free Comodo powered SSL certificate as well. These two companies are affordable, cheap, and offer features quite similar to BlueHost. WPEngine is also a great option but demands more money which small bloggers usually cannot afford but if you can then must try them. So, which one you think is a reliable Bluehost alternative and why? BlueHost Review 2019: Should You Buy it?